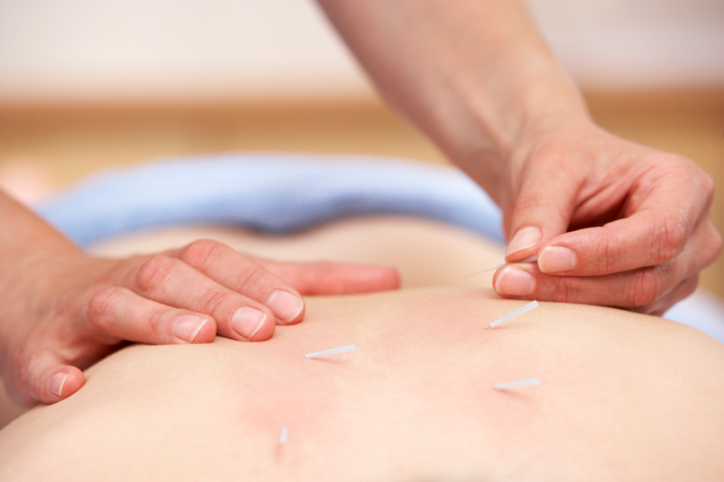 Acupuncture may be effective alternative to morphine in relieving dyspnea in patients with non-small cell lung cancer. Researchers led by Anna Minchom, MD, of the Royal Marsden Hospital in the United Kingdom, performed a single-center, randomized phase 2 study of 173 patients with NSCLC or mesothelioma and had a dyspnea score of at least 4 on a visual analogue scale (VAS). Patients were randomly assigned to receive acupuncture alone, morphine alone, or both, with acupuncture being administered at uppersternal, thoracic paravertebral, and trapezius trigger points. Primary endpoint was the proportion of patients who achieved improvement in VAS dyspnea. The researchers found that VAS dyspnea improved by at least 1.5 in 74% of patients given acupuncture alone, 60% in those given morphine alone, and 66% in those given both, and this improvement was maintained in 45% of patients at 2 weeks. They found no statistically significant difference between the 3 groups. VAS relaxation was found to be better improved in the acupuncture alone group and the acupuncture and morphine group compared to the morphine alone group. Michom A, Punwani R, Filshie J, et al. A randomised study comparing the effectiveness of acupuncture or morphine versus the combination for the relief of dyspnoea in patients with advanced non-small cell lung cancer and mesothelioma [published online ahead of print May 5, 2016]. Eur J Cancer. doi: http://dx.doi.org/10.1016/j.ejca.2016.03.078.